Habitat : Grows wild and cultivated. Uses : Hawaiian Noni is used for everything like joint pains, immune problems, pain relief, cellular regeneration and more. Noni fruit contains a number of enzymes (proteins) and alkaloids that are believed to play a pivotal role in good health. There are researches to conclude that Noni fruit stimulates the immune system, regulating cell function and cellular regeneration of damaged cells. It is particularly useful in supporting the nervous and structural systems (especially pain in joints) and for skin health. Noni has gained popularity with anecdotal evidence claiming that it is beneficial in fighting fatigue, depression, sexual dysfunction and arthritis. 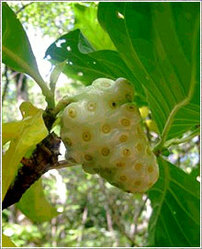 Noni Fruit is most well known for is the compound alkaloid proxeronine, which is believed to be a precursor to xeronine. Xeronine is an alkaloid, which is believed to activate dormant enzymes and support healthy cell function. This has further lead to the miraculous cures claimed by some people but Noni Fruit does have benefits that are beyond dispute. Noni Fruit is an excellent source of beneficial acids, Vitamin C and alkaloids. The fruit is taken for lumbago, asthma and dysentery. The bark of the Morinda produces a reddish purple and brown dye used in making batik.